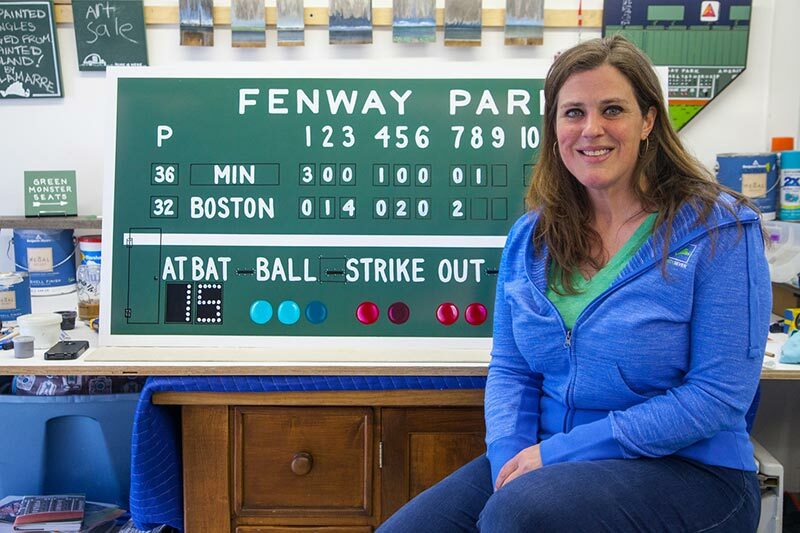 Painting Fenway’s ‘Green Monster’ has been a home run for Martha’s Vineyard–based artist M-C Lamarre. The left-field wall at Fenway Park, home field of the Boston Red Sox, is arguably one of our country’s largest and most recognizable canvases, and it has made the work of Island artist M-C Lamarre a beloved presence in homes and offices across the country. Ms. Lamarre has completed 173 portraits of “the Green Monster” or “the Monstah,” as the 37-foot-high, 230-foot-long outfield fence is more popularly known. She has commissions for several more, and has an ultimate goal of completing 300 generally customized versions of Major League Baseball’s most recognizable icon. Her work has been featured in Benjamin Moore Paint Co.’s “Colors of Fenway” TV ad campaign, which is currently airing, and her sports artistry has been the subject of regional and national print and television stories. Ms. Lamarre moved to the Island two years ago from New Bedford to pursue an affair of the heart, and stayed, entering the rhythm of Island life. As her motto suggests, she will travel with her brush, and her work appears in various Island spots, including signage in Summercamp, the former Wesley Hotel in Oak Bluffs. Ms. Lamarre’s Oak Bluffs home reflects her unique eye. It is filled with fascinating, whimsical pieces of repurposed art: a mirror made from an unenclosed public telephone box; a mailbox has become a bathroom storage unit. “My Dumpster-diving days,” she remarked with a laugh. “I love repurposing things.” She said that her artistic life on the Island includes painting scenes on old shingles she rescued from a home makeover on Chappy. On the back of each piece, she handwrites its history, and signs the work. She will begin selling the pieces this summer at the art shows every Wednesday in Chilmark on North Road. Ms. Lamarre, one of 10 siblings raised in bucolic Amherst, N.H., has journeyed far and wide in pursuit of her muse. She is a verbal and articulate person, agog with artistic ideas leavened with two important traits we all admire. First, she is able to recognize and create opportunities out of chance meetings. Second, she is grounded in reality. Art is a career driven by passion, but Ms. Lamarre also recognizes that art provides her living, and she applies personal and financial discipline to her work. Her career began predictably enough, with a degree in fine arts with a concentration in ceramics from Providence College in 1996, including a junior year abroad in Florence, Italy, and one class in painting. Then the journey got offbeat and exciting. “I got a job in Boston as a studio manager for a sports ad agency,” she said. “I learned about networking and press relations. The industry wasn’t for me, and I temped for three months until I got a job at the Cambridge Arts Council. “One day a brochure for the Art Train crossed my desk, and I applied for a fellowship and got it. We toured the country on a train, a traveling art gallery that tours the country bringing themed art exhibits to small towns without museums,” she said. The Art Train began in 1971 as a one-year state cultural initiative in Michigan, and caught on, garnering federal support. The Art Train has now been touring for 45 years, offering themed exhibits from NASA to Native American art. “The Monster is not just a wall. When people see it, the first thing out of their mouths is a story involving the wall, a memory, remembrance. The connection and emotional investment they are making is real. It’s amazing how the Monster has taken on a life of its own, in my work and in the way people relate to it,” she said. Professional players are not immune to the pull of old ballparks either. Ms. Lamarre recalls a comment made to her about Fenway and the old Yankee Stadium by former New York Yankee player Bucky (Bleepin’) Dent, whose 1978 playoff home run famously broke the hearts of Red Sox Nation. “As a player, I knew that these were special places where Joe Dimaggio and Ted Williams had played, in these parks where I was playing,” Mr. Dent told her. Most of her Fenway murals are seamlessly customized to include dates and names important to the client. She integrates them into the names and numbers on the scoreboard at the base of the wall. In the artistic scheme of things, making a career from renderings of a green wall is a stretch, until you know the artist and her capacity to see art in everyday things. Ms. Lamarre’s body of work avoids cuteness and assignment in an artform niche. In all likelihood she will not stop at the Wall, and will have a monstah career.